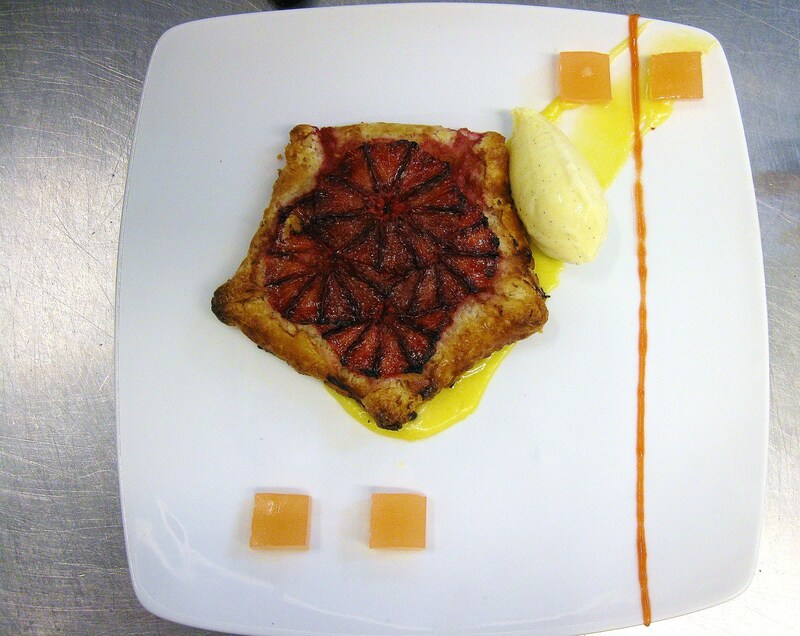 When the restaurant accidentally received a case of blood oranges instead of the navel oranges that had been ordered, it became the pastry department’s job to use them up. I made a batch of blood orange sorbet, but I also made this blood orange crostata for sunday supper. This is a recipe I have been lusting to make for almost a year, ever since I saw pictures on a food blog called smitten kitchen; but I kept forgetting about it until the after the events for which it would have been appropriate. I didn’t even remember it for this project until I was trawling the internet on Saturday night trying to think of something to do with an entire case of citrus. However, as soon as I saw the pictures I was hooked all over again. I made the recipe almost exactly as she suggests but with probably a little more butter and less sugar on the fruit. I also added a little cinnamon to the crust. A crostada is a rustic, free-form tart which generally has a fairly thick crust that is just folded over to make an outer edge. I think one reason that slices of pies, tarts, and cakes, are generally served with just a scoop of ice cream or maybe a sauce is because there aren’t that many garnishes that can enhance a well made slice. This was how I felt about my crostada. I clearly had my work cut out for me, as my inclination was to say that the tart by itself was perfect but the powers that be did not agree. So, I went in the opposite direction, pulled out all the scraps and extras, looking for delicious bits that I could put together with this tart on a plate. This included a bunch of citrus pieces that we had left over from experiments planning for a grapefruit dinner and for Valentine’s day. I ended up only including the smooth, rich passionfruit mousse, a tangy blood orange sauce, and jello-like grapefruit gelee squares. I also made a very quick, creamy vanilla bean ice cream to balance all of that acidity. This dish wasn’t bad (besides the fact that I made the tarts so big that they didn’t fit on any of the plates we have in house) but it wasn’t great. It was a tasty dessert, but I don’t think the other elements of the plate improved on the tart. I thought the tarts were beautiful, but their beauty was in their rustic nature, and they really were best alone. What is a cheesecake flan? For New Year’s Eve the restaurant planned a special five course tasting menu but unlike some of our other specialized tasting menus, the New Years Eve menu had choices for each course. For the dessert course we offered three options: a chocolate dessert, a fruit dessert, and a cheese plate. For the fruit option my boss picked a recipe, of which she had done a variation for the menu a few years ago, called a cheesecake flan. She asked me to play with it a bit, changing the flavors and the plating. 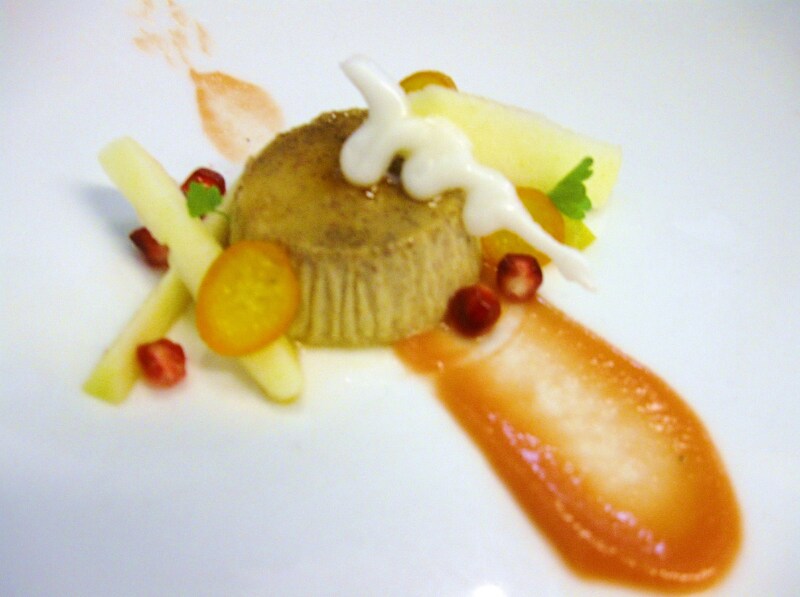 The dish pictured above is one example of the possibilities we threw around. Before we go deeply into the components of the dish above, it would probably be useful to consider the cheesecake flan itself. What is a cheesecake flan? I admit to being quite baffled myself when she first handed me the recipe until I made it and tasted it. The texture is exactly what you would expect if you mashed a creamy dense cheesecake with a slick eggy flan. The result is actually quite nice, dense but also light, cheesy but not cloying especially when served with an acidic element to cut the fat and sweetness. I chose gingerbread as the main flavor for the cheesecake flan because it seemed festive and the spices were well balanced by the creaminess of the cheesecake element. The apples added a fruity juiciness and some texture. I soaked them in a water infused with fresh ginger to keep them from discoloring and to add dimension to the gingerbread spices in the cheesecake. The pomegrante seeds and candied kumquat added some much needed acid and color. There is also a lightly sweetened guava sauce to act as a bridge between all of the other components. Because I was thinking about gingerbread houses all day and I had a little bit of extra time I also piped some quick sugar icicles. I hope the people who ate this dish found them whimsical and not trite, though I suppose confusing is also an option. Overall, I was satisfied with this dish, I thought once I got past the “what is this” stage that the plate came together in a well balanced and fun sort of way. Lately, I have been throwing these dishes together at the last minute because the weekends are so busy that Sunday evening sneaks up on me. I haven’t been happy with many of these last minute efforts because while not necessarily bad, they just weren’t fully thought out and therefore, not completely successful. This was an exception; although I came up with this dish at about 2 pm Sunday afternoon, I was actually pretty happy with it. This may have something to do with the fact it’s not very original. I used three elements from other dishes of mine and stole the plating from my fig dessert, but that’s an aspect of learning: figuring out what you liked of what you have done before and recreating it in a different context. For this dish I made a gingerbread cake with fresh ginger as well as extra large amounts of dried spices and molasses. This cake was cut it into cubes which were stacked on top of a lavender-caramel swoosh and had apple cider sauce spooned over the top. 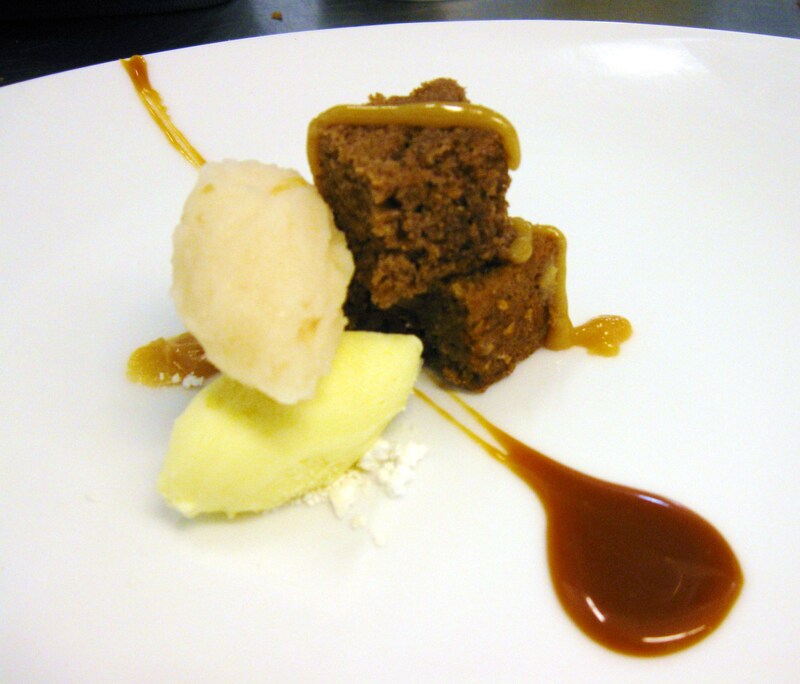 This is complemented by quennelles of apple cider sorbet and creme fraiche ice cream. The combination is not innovative but it was delicious, and I really like gingerbread spice around the holidays.